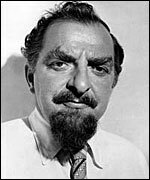 With a touch of the farouche, wild-eyed Hugh Griffith was a formidable character player, the highlight of whose 40-year film career was winning a supporting actor Oscar as the Sheikh in Ben-Hur (US, d. William Wyler, 1959), though his wildly blusterous, Oscar-nominated, Squire Western in Tom Jones (d. Tony Richardson, 1963) is just as film-stealing. Formerly a bank clerk, RADA -trained (Bancroft Gold Medallist) Griffith was on stage from 1939, had seasons at Stratford, the Old Vic, on Broadway, and did a lot of touring, with King Lear his favourite role. He entered films also in 1939 and quickly showed he didn't need much screen time to make his presence felt: witness the Lord High Steward in the penultimate episode of Kind Hearts and Coronets (d. Robert Hamer, 1949), the fire-breathing Professor Welch in Lucky Jim (d. John Boulting, 1957), the vengeful magistrate in Oliver! (d. Carol Reed, 1968), to choose three almost at random. In his last 20 years, he was much in demand for international films.